The bold graphic style of Piet Mondrian makes him a good modern artist for kids to study since they can easily replicate his style in simple art projects. 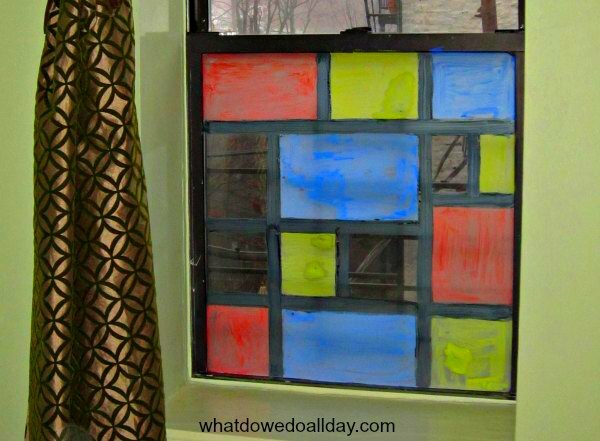 We like to create window art to hide our less than perfect view and painting a faux stained glass window was a fun way to learn about Mondrian with the kids. I love the way our Mondrian window art turned out and the activity kept the kids busy indoors after school on a rainy afternoon (bonus!). If you combine the art session with a little reading (see book at the end of this post) you can have a even have a mini Mondrian art lesson! We’ve made stained glass with cellophane before, but this time we used paint. Not to worry, it washes right off. Paint brushes and trays or cups for the paint. If you follow me on facebook, you saw the above preview of my set up. (Are you following me on facebook? I’d love to have you!) While the kids were at school I created the Mondrian style grid with painters tape. There’s no reason why kids can’t do this part themselves, but with my boys it always helps get them in a creative mood if I have everything all ready to go and offer a bit of an appetizer, so to speak. Otherwise, they just devolve into wrestling on the bed. Mondrian’s Neo-Plastic paintings used white, black and the three primary colors yellow, blue and red. We decided to forgo white and instead allow the transparency of the glass to play a role. To begin, we put yellow, red and blue in dishes. In order to avoid confusion and “mess ups”, we designated which areas would get which colors by dabbing a colored dot in the middle of each rectangle. That way the boys (and especially my 5 year old) would stay on track. There’s something a bit subversive about being allowed to paint directly on the windows, so of course they got really into it. They loved painting the shapes. I recommend peeling the tape off before the paint completely dries. It’s not essential, but sometimes the tape pulls of the paint around its edges after it has hardened. After you peel off the tape you want to paint in the black lines. I actually painted on the black lines myself. To be honest, the boys had moved on to other things (wrestling, mostly) and I couldn’t get them back into painting. No doubt kids with longer attention spans can see the project through. I especially like how the frame of the window is the same width as the black lines. That was purely by accident. We all loved how it turned out, despite the blobs in some of the rectangles. I had to saturate this photo to get it to reflect the actual color. I wish I was a better photographer. (In other words, my walls are not actually that strong green color.) We haven’t washed it off yet, but it washes off quite easily with soapy water. Long time readers of this blog (yay for you!) 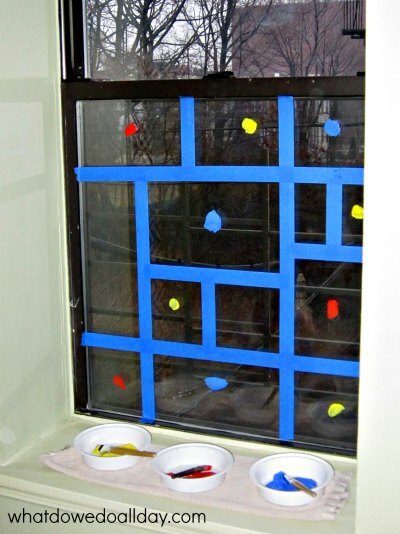 may remember way back when when I encouraged window washing with just this sort of window painting project. *We had two different brands of tempera paint: Colorations from Discount School Supply and Sargent Art. Colorations stuck to the window much longer. The Sargent Art (which was actually more expensive) started to flake off! I’m excited to turn our window into a canvas for masterpieces by other great artists! Who should we do next? Coppernickel Goes Mondrian. This underlying theme of the book about how Mondrian transformed a way of seeing things and a modern world is rather sophisticated. The text itself I found a little confusing and it could use some editing. However, pick it up at the library, because the illustrations are wonderful. The animals journey through the city and as they do, the landscape changes, just as Mondrian’s own art underwent its own transformation. 6 Mondrian pieces at the Tate show the transformation of his style. I love this idea – so pretty and fun! Aw, look at you with bars on your windows, you urbanite! I absolutely adore this project- it’s amazing. Yes, the bars. It does look a bit like a jail at times. But better that, than a fall! I can’t remember the age at which the kids need to be in order to legally remove them. This looks like fun!! I love Mondrian. We’ve done a few Piet Mondrian projects. 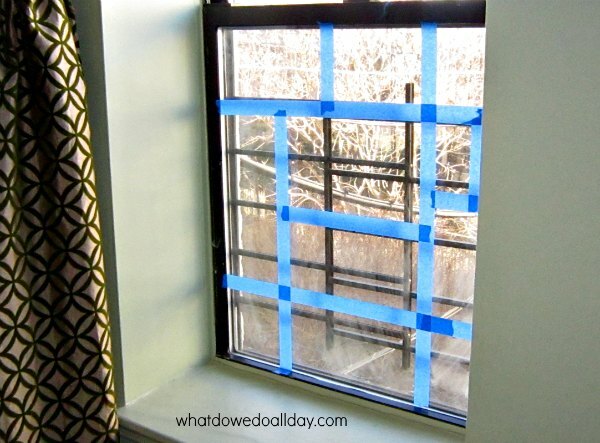 I LOVE the window idea – we’ll definitely be trying that some free afternoon! Thanks Tonia. Have fun with it! Thanks so much for including me Erica!!! 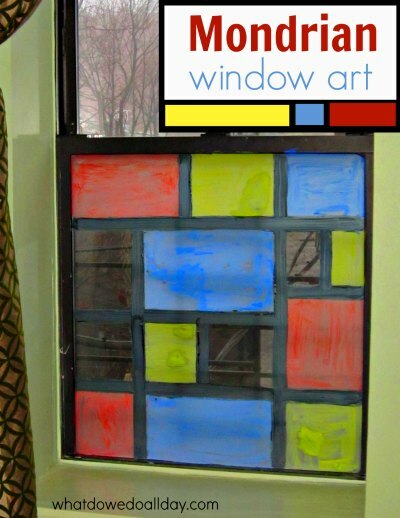 I thought on FB that this is what you are going to do 🙂 Mondrian abstract looks great on your window! I love the process and the finished window. It looks like so much fun. Thanks for sharing on Artsy Play Wednesday. LOVE this simple art project! 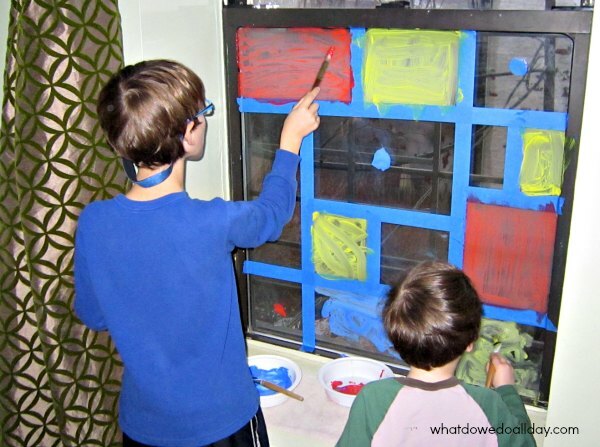 Kids would adore the chance to paint on the window too! They love it because it seems like they are getting to do something they are not supposed to do! So pretty!Thanks for sharing at After School! These turned out so great! I featured them as part of my round up today.